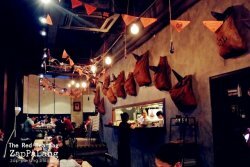 Another Friday here at publika right after lunch brings me back to Publika for a quick fix! 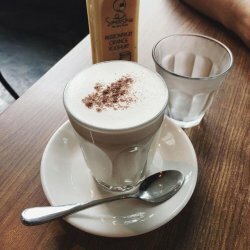 Instead of my mandatory coffee, I decided to have chai latte and the boy had the passionfruit, orange and yoghurt combination of smoothies for a thirst-quenching session. The chai latte came in a small glass. The foam was velvety and smooth and was finished off with a sprinkle of cinnamon spice to make it more oomph. 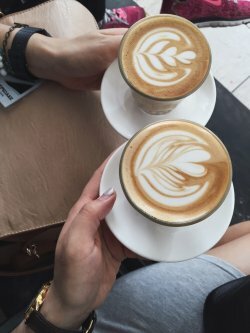 Basically chai latte is a drink that originated from India. 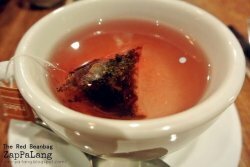 It's a black tea with the addition of aromatic Indian herbs and spices. 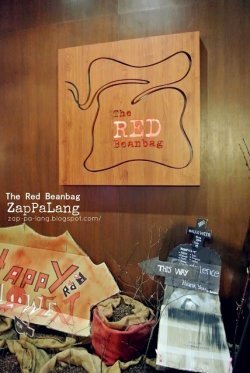 Everyone assumes that The Red Beanbag only serves out good coffee, but they also do really good chai latte. The chai latte was a tad bit of a different version as compared to the ones served at Coffee Bean. This chai latte has a hint of spiciness to it. Everyone have difference preferences, so this one is an acquired taste. The smoothie was thick and it is best to down it with a glass of ice to dilute it if you are alike to me. I prefer my smoothie less thick, somewhere in between liquidy and thick.The addition of passionfruit and orange brings tanginess into flavour. 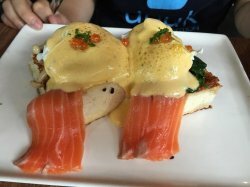 I had the Eggs Atlantic which came with two slices of fluffy French toast and smoked salmon, perfectly poached eggs slathered off with hollandaise sauce, topped with salmon pearls that pops with every delicate bite. You get the best of two worlds with this order - one had sautéed mushroom fillings; the other had seasoned baby spinach in it. This dish was beautifully presented and the flavours were contrasting. The boy had his favorite AglioOlio Pasta. This dish is a hit with the vegetarians. 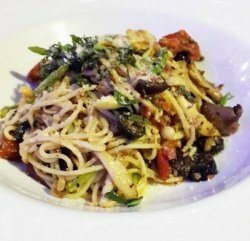 It is chock full of shrooms, sundried tomatoes, olives and much more! It was a long queue when we accidentally went on public holiday, but we decided to wait and it was a worthy decision that the food met our expectation and we were super satisfied with our branch. 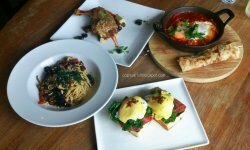 The RBB Signature Breakfast (RM 19.90) with poached, fried or scrambled eggs on toasts, sauteed mushrooms, grilled tomatoes, beef/chicken sausages, beef bacon, baked beans and hash brown(RM 19.90).This is perfectly taste breakfast which worth for it. The saving grace came in the form of eggs Benedict (RM15.90). 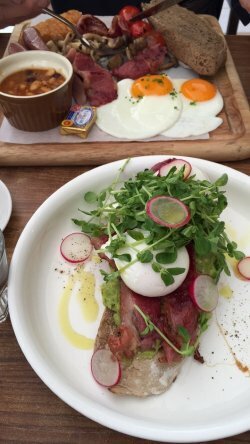 The perfectly poached eggs were such a satisfaction. 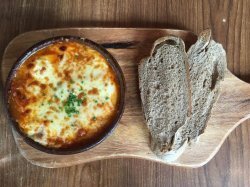 RBB’s specialty baked eggs (RM 17.90) were pretty good too. 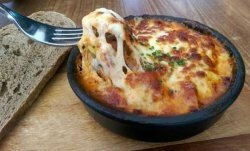 Perfectly baked with eggs cracked into a baking dish of lamb bratwurst or chicken, sun-dried tomatoes, potatoes and cheese, also served with crusty bread. There is also classic French toast (RM13.90) coated with almonds, served with seasonal fruits and maple syrup. It was so soft and fluffy and the almonds coating gives crunchy bites to it. 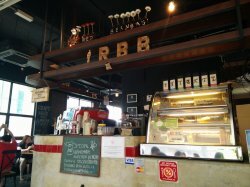 For all coffee lovers, RBB have nice art and tastable coffee that satisfy your addiction of caffeine. Pre-booked dinners for functions available. although the service crew didn't provide polite service, but still have to give their food a big applause!especially the eggies! which is i love the most! it's all day breakfast, the price is RM24 for each. 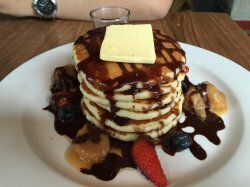 luckily i've got a voucher for 50% discount in a single receipt then their pancake, hmm not really delicious, the cake are quite hard to bite. then the salmon bread, it's good and tasty as well! yummy ! although the service crew didn't provide polite service, but still have to give their food a big applause! 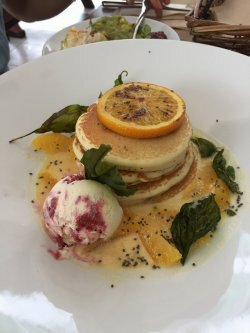 then their pancake, hmm not really delicious, the cake are quite hard to bite. then the salmon bread, it's good and tasty as well! yummy ! 这家面积不大, 藏在1楼角落不起眼的餐厅享有很高的人气, 我不只一次听过朋友们说过他们的食物不错, 很多部落格也推荐了, 我们今天就来看下到底什么名堂哈! 翻开餐单, 我觉得有点吓到因为选择很少, 主打的竟然大部份只有鸡肉和鱼, 而这两样我想都不是西餐的热门选择。我尤其怕点鱼,因为怕吃到那些软绵绵, 一点鱼味也没有的"冰箱鱼", 那口感就好像泡湿的纸巾, 你们有同感吗? This place has been a hit for a long time that i never have the patient to Q on the weekend. And finally manage to pay a visit during an offday on weekday. Ordered The Atlantic to try instead of the usual Egg Benedict. 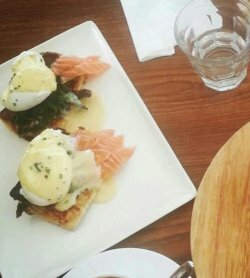 The portion come with house smoked salmon served with salmon pearls, wilted baby spinach , sauteed mushrooms on a fluffy french toast and of coz drizzled with hollandaise sauce and poarched egg. All are perfectly done and fresh for breakfast. 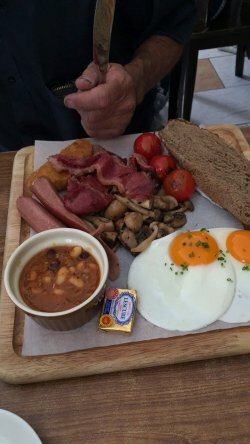 Ordered the Super Awesome Fry - up (BIG BREAKFAST) to try. 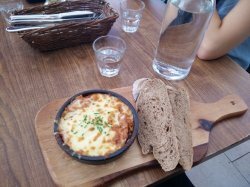 The portion came with choice of eggs,sausage, bacon,baked beans, hashbrowm, sauteed mushroom & toast. The sausage is good but the others that come with just taste normal. I finally got to try The Red Bean Bag. 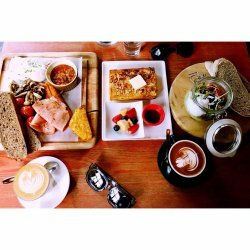 It's usually really packed with a long wait but my friends and I arrived earlier in the morning and were lucky enough to grab a table just before the crowd came. 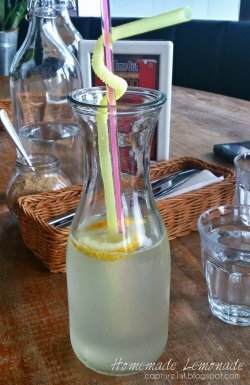 The restaurant's outlook is very comfortable and the service was alright. not much to complain about. They do come to quickly clear your plate almost immediately once you're done. Their menu is split into the Light Side and the Dark Side. The Light Side has lighter meals for those who aren't as hungry. Price of course is less on that page. On the other side, is where the real meals are.
. The meat was also very tasty and well seasoned. It was a lot of flavor packed inside one meal. 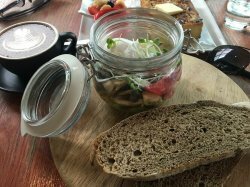 On the side, the meal was served with some sour dough bread to eat with the delightful baked meal. 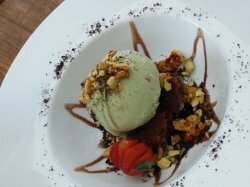 For dessert, we ordered their special homemade avocado ice-cream on top of deconstructed brownies with nutella fudge sauce. The avocado ice-cream was really sweet and creamy. 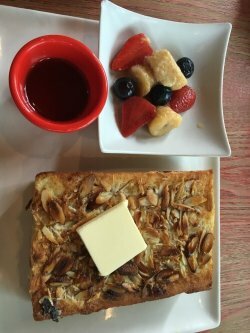 While the brownies were pretty average, i think there was also some sweet honey biscuit cubes that really made the meal for me. 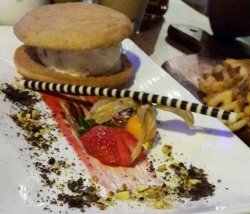 It was a great dessert while the portion was a little small. I would recommend this place for family day time meals and maybe afternoon dates. 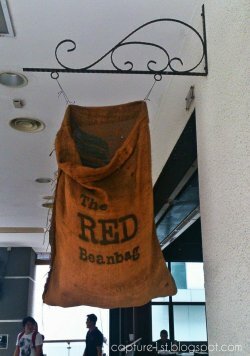 The Red Beanbag has paved its way as one of the pioneers of the KL cafe scene. Food is delicious. 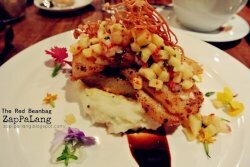 Alot of choices and each item on the menu is crafted to perfection. 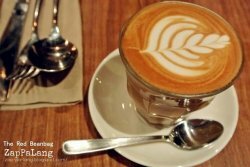 Coffee is excellent as the team is trained by the Malaysian Barista Champion. Service was great and the space is cosy and inviting. Be prepared to queue during weekends. We have been back many times and the quality is consistently good. 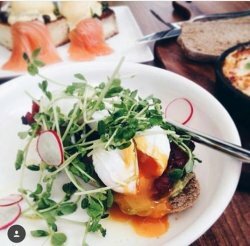 They specialise in poached eggs- oh boy, their poached eggs are the best! The Gone Bananas french toast is divine. Thomas brought me and YeeLing to there when he was having SEM break. I never know the shortcut way till that day. My first visit to here!! Thank you so much for bringing us to EAT. The shop can be seen from Ichiban Boshi and at 1st floor building (at the corner). When comes to their menu, it separated into 2 parts, the DARK side and the LIGHT side. 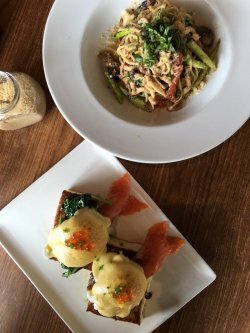 It consists of turkey ham served with kale, sautéed mushrooms, and roasted garlic butter Portobello mushroom on a fluffy French toast, drizzled with hollandaise sauce and served with two poached eggs. I personally love the...RUNNY YOLK? 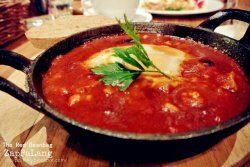 YES, the RUNNY YOLK!! It flowed once I cut it. It is a roasted chicken thigh with herbed potatoes, mushrooms, olives & mushroom gravy. The sauce on it was flavorful and suits perfectly with the meat. My best friend really loves it. And know what? 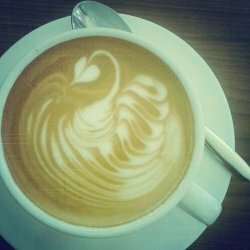 It was made by one of the BARISTA from The Red Beanbag, Jason Loo (The Champion of Barista 2013)!! Ohh yea! Follow me on Instagram ( @capture1st ) to get more instant updates of pictures! Other Info. : Monday closed. Kitchen closed at 4PM-6PM daily. I had eggs benedict here for breakfast because people kept telling me that it was good. However I found that it was not as good as expected. It was decent, but was lacking something. Overall, I found it quite pricey for what I got, but the smoked salmon was nice and salty.